Home for Cooperation opens this week! CCMC member the Association for Historical Dialogue & Research (AHDR) are inaugurating their new shared Home for Cooperation in the buffer zone this week. Excitement is reaching fever pitch as we count down the days to the launch. There will be a range of events going on between 6 and 9 May 2011, so please check the attached flyer for the full schedule. The flyer is available for download in English, Greek and Turkish. What a night! 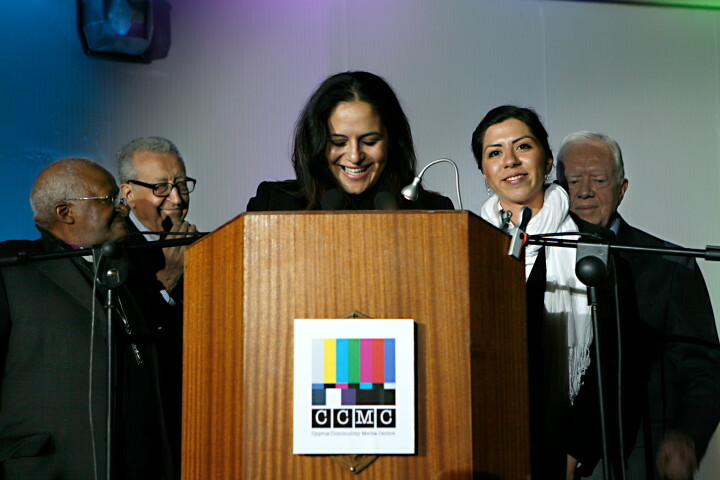 On the 9 December 2009, the Cyprus Community Media Centre (CCMC) had its opening event at its new premises in Nicosia’s buffer zone. The centre was officially opened by three members of the eminent ‘Elders’ group, Lakhdar Brahimi, Jimmy Carter and Desmond Tutu. Hundreds of people came along to celebrate with us, and hear directly from the Elders themselves, who were in Cyprus to support individuals and organisations seeking to build greater trust and dialogue between the communities of the island. The Elders expressed their support for the new centre, and their desire to see a positive outcome to current political negotiations. Speaking at the event, Desmond Tutu said that Cyprus was full of untold and beautiful stories and that he hoped “the community media centre could be a vehicle for these stories to surface.” The guests, which included media professionals, artists, creatives, and members of the diplomatic community, also had the opportunity to see the work of the CCMC through multimedia installations, video projections, photographs and stories collected from across Cyprus. Were you there? Did you have a good time? Let us know! Desmond Tutu, Lakhdar Brahimi, Nadia Karayianni, Ilke Dagli and Jimmy Carter, 9 Dec 09. 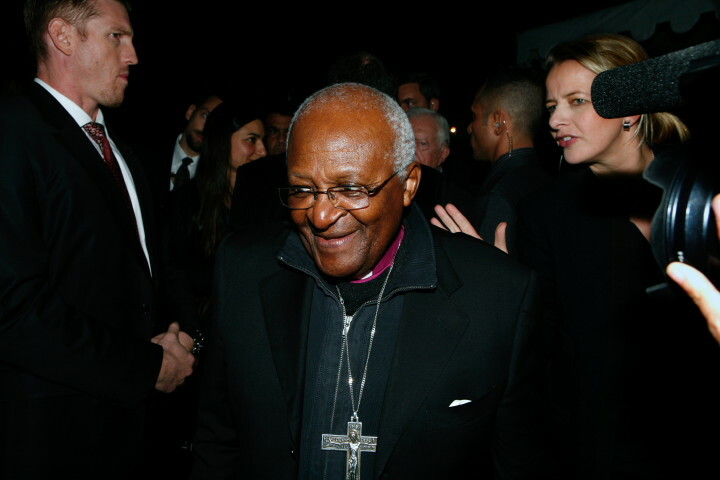 Honorary guest Desmond Tutu, at the CCMC opening event, 9 Dec 09. It costs just $1 to place a landmine in the ground, designed to maim and kill, but up to $1,000 to remove it. But above and beyond the financial cost of clearing landmines comes the devastating risk taken by brave deminers. The CCMC was very saddened this week to hear of the death of 49 year old Femisberto Novele , a demining and bomb disposal expert from Mozambique who was killed in an explosion on the 28 October while clearing a minefield in Yeri, ten kilometres southeast of the Cyprus capital, Nicosia. Novele was part of the UN Mine Action Centre Cyprus (MACC) team. In the past five years MACC has removed and decommissioned over 14,000 mines and cleared 57 minefields in the 180 kilometre long buffer zone that divides Cyprus. The MACC team has been responsible for clearing border crossings and areas such as Ledra Street, making it possible for people to travel more freely throughout the island. In Novele’s home country of Mozambique, however, the threat of mines is far more widespread. Anti-personnel mines still lay strewn across parts of the country: a deadly legacy of conflict. During the war of independence, the Portuguese laid mines along roads, followed in the late 1970s by the Rhodesian forces which mined Mozambique’s border areas. Mines were also used by private companies trying to protect their factories from guerilla forces. As well as the obvious human cost, landmines also hinder economic development and stop people being able to grow crops, get access to clean water, and build infrastructure. Much of Mozambique’s farmable land is still unusable due to landmines, which accelerates food shortages, and creates crises such as the devastating famine in the 1980s that sent huge numbers of refugees across the borders into South Africa, Tanzania, Malawi and Zambia. There are still an estimated 70 million landmines in the world, which cause 19,000 deaths or injuries a year, one third of which are children. In order to stop mines claiming lives, they need to be categorized more strictly under international law, and banned. Femisberto Novele was MACC’s first fatality since the start of the project in Cyprus but there have been nine landmine and booby trap injuries in Cyprus in the last year alone. Provided the funding continues, MACC aims to rid Cyprus of mines by April 2011. The process is painstakingly slow and dangerous and we are grateful to the courageous individual deminers, such as Novele, who make it possible for us to walk in safety.